If in doubt call a professional!! Simple right? Actualy, yes. lets look at when to use, then we can get into HOW to add to a system. Note - there are other chemical types - leak sealers, inhibited antifreezes, glycol's, details of which are at the bottom of the page. Lets look first at inhibitors. 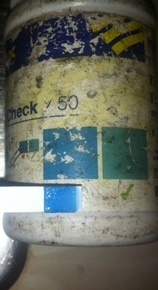 There are several makes / brands...... you pay your money, you take your chances - Fernox and Sentinel are known trusted brands but are not cheap. 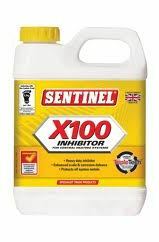 For now we will look at sentinel X100 inhibitor. Its a yellow litre bottle, and one bottle is enough for most central heating systems. 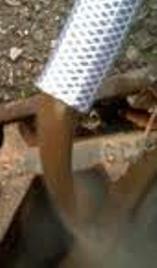 The reason we add inhibitor it to prevent corrosion and build up of sludge and scale. When a system is filled, its filled with tap water, which contains oxygen, and minerals. oxygen plus water plus steel plus heat = rust. Minerals plus water plus heat = scale. Inhibitor prevents this happening...... simple....... Inhibitor does break down over time, and should be checked every year, and replaced every time the system is drained. Some inhibitors also contain antifreeze....... consider using this if you have an outdoor oil boiler. How critical is inhibitor? A mid range combination boiler will last about 18 months if not inhibitor is added. And thats 18 months till boiler is finished. 2) The installer who doesnt add inhibitor also doesnt bother to flush out the flux from the pipework, flux acts as an acid descaler in the system. - sentinel sell a kit, like a diabetes test - a small strip of paper - run the system, and then, when warm, bleed a drop of water from the radiator bleed valve onto the strip - the color will change accordingly. As you see in this picture, more inhibitor is required. You cannot ever add too much inhibitor, so the more the better. Comment - if you are regularly refilling your system due to leaks or pressure vessel issues - you will have almost no inhibitor left - be warned! 1) 'Leave in the system' types - non acidic, contain 'anti flocking' agents mostly - they just stop the crud clumping and blocking things up. 3) To flush out new systems, again, these must be flushed out, once there finished, the job of this type is to neutralise and dissolve flux residue and new system detritis. Ok........... it gets a bit confusing here, and we must now look at WHY we are adding chemicals. The third type, obviously, are for when a new system or boiler is installed - do as directed on the bottle - run and drain. The other two types are broken down into several subsets. The next section looks at what the problem is, so a descision on what to use can be made. This is always the best indicator of the overall system condition. Run the heating till all radiators are hot, then bleed a glass full from a radiator. Inky black is bad, it shows stable magnetite sludge, but is much better than brown, - essentialy rust! Brown suggests no inhibitor at all and repeated refilling with fresh water. Yellow is better, - its the start of corrosion, but not overly far advanced. Almost clear is ideal...... but it wont be! Ok.......Those are words your plumber will have used. Not very useful here. Does the boiler lock out when running a bath? does it make knocking and banging sounds? does the tap water go hot/cold/hot cold? does the tap water never get above lukewarm? 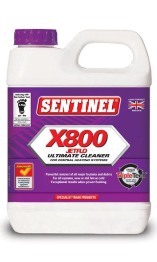 Again, my favorite is Sentinel X800........ leave in for a full week and drain....... possibly repeat if you feel the need, (drain, refill and add a second bottle), if no joy, try removing radiators and running through with a hose.... if not..... powerflush! 'System' boilers tend to suffer from a softer scale than combi boilers...... so the 'draindown' is far more important in this instance.... the more system water you get out, the better the result..... imagine the system is full of mud. Ok, lets look at how to add chemicals and get them out! The easiest way is a small radiator with end caps, or even better a ladder style towel rail. In the first instance, turn the radiator off at BOTH ends. 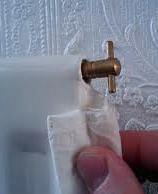 Towel rail - (with top caps)...... remove top cap, insert hose half way down the rad, and syphon the contents into the toilet. Pour in chemical, refit cap, reopen valves and again, bleed when warm. Feed and expansion tank - turn off the water to the tank, (btw, if you add chemicals to your storage tank your going to be mighty sick) turn off the system, bail the tank empty, add chemical and then bleed radiators till the chemical is almost gone, add a litre of water, bleed / drain from lowest point till almost all water has gone from tank, then turn the water back on, and run system. If you dont do this, in most cases you will just end up with chemical staying in the header tank! This is a two man job, as if you end up emptying the tank an air lock is likely. The best way is to use drain valves that the system should have..... remembering to drain all pipework drops, which also should have drain valves. 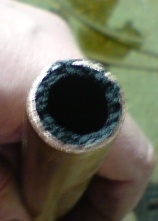 A good method is to remove a small radiator and attatch a hose to one of the valves. 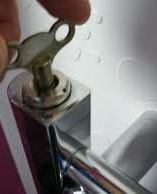 The best results can be obtained by draining while filling for half a day.....while running the boiler....... not easy but if you can balance the flow of water in to the flow of water out - either via filling loop or expansion tank, ensuring the system remains full at all times...... then drain fully. Never run the system while drained. To refill ............................ errrrrrr......... thats covered under 'how to get the air out of a system...... it needs a page to itself! Leak sealer - a chemical that when added to the system acts like blood, and coagulates as it leaks out........ designed to block small leaks...... um........ I have used a lot of this over the years, but im still not sure about it. 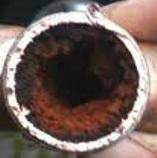 If your not sure you can refill your system, dont drain it.